Bible: God is the Creator of all things (Genesis 1) Evolution: Natural chance processes can account for the existence of all things. 1.Description: Everything in the universe came into existence and evolved as a result of natural processes unaided by any supernatural power. 4.Major Problem: Cannot explain the origin of matter (it is eternal). Unable to justify organic life emerging from inorganic matter. Gaps in the fossil records with no transitional forms goes against their view. It too is based on a faith system. 1.Description: Everything in the universe came into existence and evolved as a result of natural processes guided by God. 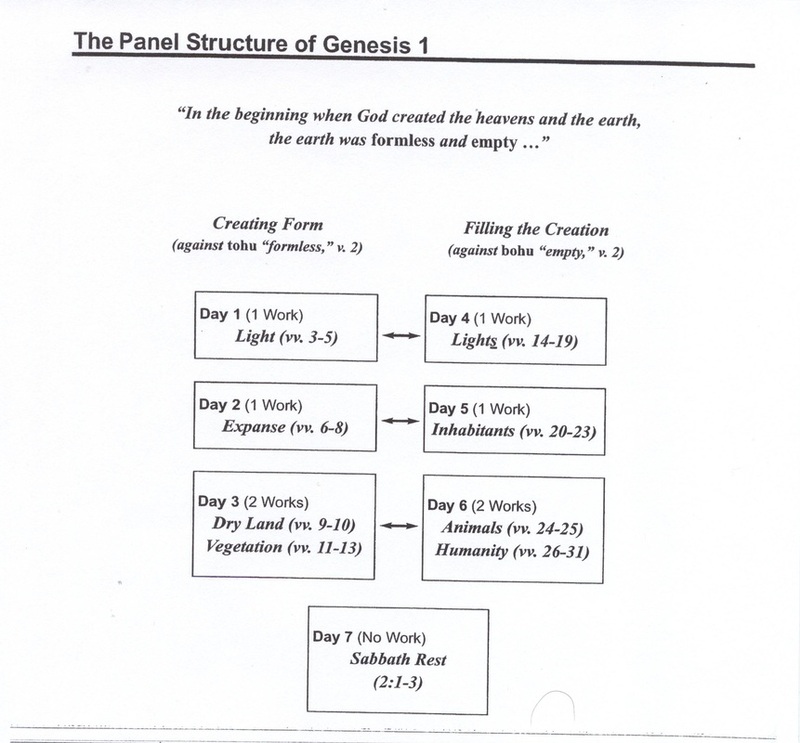 3.Treatment of “Day”: Either they don’t believe the Bible or take “day” in Genesis as an age. 4.Major Problem: God may intervene in times contradicts the basic theory of the evolutionary process. The evolutionary process contradicts record of creation in the Bible. 3.Treatment of “Day”: They take “day” in Genesis as an age. 4.Major Problem: This view tries to accommodate the scientific data with the Bible but they run into difficulties and unusual interpretations to harmonized the Bible with scientific data. Death entered the world before the Fall. The word "day" is sometimes used in the Scriptures to describe a period of time longer than a 24 hour period ("the day of the Lord"). 2nd Peter 3:8 states that with the Lord one day is as a thousand years. The sun and the moon are not created until the 4th day. This indicates that the previous days are not literal. The word "day" does not normally refer to an extended period of time when it appears with a modifier (1st day, 2nd day, etc). These days are clearly defined in Genesis 1:5 when God calls the light day and the darkness night. The very purpose of the sun was to rule over the day while the moon was to rule over the night. 1.Description: God created the universe described in Genesis 1 which took place 6,000 – 15,000 ago. They use a normal, literal hermeneutic and rely on exegesis of the passage. This view places a great chronological gap between Genesis 1:1 – 2 during which the earth was destroyed and then recreated. According to this theory, millions of years ago God created a perfect heaven and earth. This universe continued in a perfect state until Satan rebelled by desiring to become like God (Isaiah 14:12 – 17). Because of Satan's fall, sin entered the universe. As a result, the earth became "formless and void" until a global ice age swept over the earth as light and heat were removed. The six days which follow refer to the reconstruction of the earth. The words tohu wabohu ("formless and void") are said to refer to a destruction which took place after God's original creation. In Jeremiah 4:23 and Isaiah 34:11 these words describe a destruction. Isaiah 45:18 says that God did not create the earth void (tohu) while Genesis 1:2 says that the earth was now void. It is reasoned that the earth must have come to be in this manner after its original creation. The darkness which characterized the formless and void condition is indicative of evil. The normal rendering of hayeta is "was" and indicates a state of being. The words tohu wabohu ("formless and void") need not describe destruction. They can just as easily describe an unconstructed state. Isaiah 45:18 simply tells us that God's intention for the earth in its completed form was that it would not be tohu, but rather that it might be inhabited. The prophet is simply stating the purpose of creation. Darkness does not always indicate evil. Both light and darkness existed upon the finished earth and it was still said to be good. The following is a paper I, Bryan D. Stallings, personally wrote. I am sharing it with you that it might further aid in your studies. To copy/paste this paper and submit as your own is PROHIBITED! Evolution remains simply the change from one state to another like the properties of organisms transcending down through the lifetime of a single individual. The changes that remain evolutionary are those that exist as inherited through the genetic material from one generation to the other. In short, evolution exists as a process resulting in handed-down changes in individuals spreading over many generations. Evolution reaches backwards and grasps the great cosmic problems of birth and growth of the earth, the life of matter, and the relationship of the universe to its well-organized cause. On the other hand, creationism exists as a religious belief in that humanity, life, the Earth, and the universe where the creation of a supernatural being. Creationism refers to a wide range of beliefs. The debate between Creationism and Evolution got moving in the 1820’s when Reverend William Buckland refuted the Biblical basis for geological history and has progressed to this date with the help of Charles Darwin writing on natural selection in 1859, “Scopes Monkey Trial”  in 1925 (more of a scam than anything), and McLean vs. Arkansas Board of Education  in 1980. Charles Darwin, a naturalistic evolutionist, put the world on its ear when he wrote the book called “On the Origin of Species by Means of Natural Selection, or the Preservation of Favored Races in the Struggle for Life”. This book introduced a scientific theory that populations evolved over a course of generations in a process known as natural selection. Darwin revealed evidence of a diversity of life that arose from common descent branching from a pattern of evolution. However, creationists, believing in a supernatural being, have been finding ways to debunk such theories by using one tool that remains to this day a far superior tool and that is The Bible, God’s Holy Word. Even though evolutionists and creationists have not seen eye to eye, they do have one thing in common and that is that everything started somewhere and, whether gradual or radical, things are ever changing. Why does there exist such a stronghold between these two ideas? There has existed this long and deep battle between evolutionists and creationist that has caused division amongst humanity and brought, at times, people to their very knees as they have searched and attempted to teach these ideas all with one very simple goal...where did it begin. The word evolution remains vague and incorrect in its very meaning in reference to the origin of man. It has stirred the popular mind into further investigation and inquiry. At times, the doctrine of evolution touches the great problems of origin and destiny. In order to understand its humble beginnings, an explanation of the very method by which living forms where produced and developed remains. However, there exist five major problems with evolution and they are the facts of no observation been made of the evolutionary process, it violates the second Law of Thermodynamics, there exists no transitional fossils, states that life came by random choice, and it remains today a theory that has to be adjusted accordingly as time progresses. Through Darwin’s works, there is what is now known as Darwin’s Five Laws. These laws, proven by way of simulations, observations, and experiments are namely evolution as such, common descent, multiplication of species, gradualism, and natural selection. The common descent occurred by the branching of different species that share common ancestral species. Now, natural selection remains the mechanism for which evolutionary divergence of lineages and adaptations. Since there seems to exist a struggle for existence, only a few offspring survive with the ability to reproduce. In Darwin’s book “Origin of Man”, he provides support for these theories through patterns of variation in domesticated and wild fauna / flora as well as patterns supporting the common ancestral lineage. Today, the phrase macroevolution has been acquired in reference to any changes by way of evolution at or above the level of a given species that has at the minimum split into two species or the very change of a species into another over a specific time just like common descent. As scientists study the phylogenetic tree, they have come to the determination that every species contains unique genealogical history whereas each species holds to itself a series of common ancestors pointing to the original common ancestor for that species. Scientists expect organisms to carry certain evidences of this type of history and ancestry along with them. The phylogenetic tree seems to predict what type of historical evidence existed and possibly see what changes may occur in the future for each given species. Even though these theories remain provisional with the possibility of being over-ruled if adequate evidence is presented, evolution remains very close to being a fact and widely accepted. They also deny other numerous doctrine such as Psalm 33:6-9; John 1:1-3; Psalm 102:25; 89:11; 90:2; 104:5-9,24-28; 19:1; 24:1,2; 95:5; 146:6; 136:5-9; 8:3,6-8; 148:5; Isaiah 42:5; 45:18; 40:21,26; Jeremiah 27:5; 32:17; 51:15; Hebrews 1:10; 11:3; Acts 14:15; 2 Peter 3:5; 2 Corinthians 4:6; Nehemiah 9:6; Psalm 100:3; Proverbs 3:19; and Zechariah 12:1. Just as creation should remain a fundamental reason in the belief in God, so evolution remains a fundamental tenet of unbelievers. When one denies the obvious proof of God’s existence, you deny creation. There has existed this long and deep battle between evolutionists and creationist that has caused division amongst humanity and brought, at times, people to their very knees as they have searched and attempted to teach these ideas all with one very simple goal...where did it begin. There exists no adequate explanation for the actual origin of man or life, even down to the simplest forms of life remains tremendously complex. Fossil records lack the transitional forms that would make any links from one species to another. The so-called pre-man (ape-man) fossils remain simply to be those of extinct apes, a fully man, or historical frauds. The scientific community rejects any ideas from creationists because science looks at tangible evidence for its support where as creationists believe in the supernatural unseen world. Science remains to this day unable to answer the question of where did the material come from that initiated The Big Bang. They look to the religious community to answer this and many other question and simply refute the answers they receive. One should always rely on The Scriptures for the difficult questions in life. However, we must remember that there exist people that are riding the fence line in the attempts to decide which side to fall on, evolutionism or creationism. The church has long stated that creation remains a key article of faith. For the church, these stakes remain high of losing these people to evolutionism. If the polls are correct, we as Christians have ultimately failed in teaching faithfully the faith for which we believe. Douglas Theobald, “29+ Evidences for Macroevolution, Part 1: The Unique Universal Phylogenetic Tree”, 1999, <http://www.talforigins.org> (accessed March 27, 2011). S. Brian Stratton, “Genesis after The Origin: Theological Responses to Evolution,” Word and World, Winter 2009, pg. 11.